« 45 sales signed up in three days! 2nd week of registration starts: Almost 100 sales! 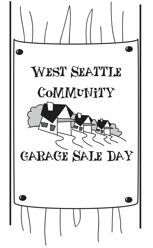 More than 95 sales are now on the list for the ninth annual West Seattle Community Garage Sale Day, coming up Saturday, May 11th. Registration will only be open for two more weeks, so you might as well commit now. One important note: If you have signed up, please be sure you have a receipt from PayPal as well as the WSCGSD confirmation note – our records so far show a few people have made it through the first part of the process but not the rest of the way – e-mail garagesale@westseattleblog.com if you’re not sure. Ready to sign up? Here’s the link! Not enough room for your own sale? The two coffeehouses that usually offer a bit of individual space (both WSB sponsors) are doing it again. First: The courtyard/parking lot area between Hotwire Online Coffeehouse (4410 California SW) and Ginomai art center is open for registration, according to Hotwire proprietor Lora Swift – e-mail her at info@hotwirecoffee.com to get a free space! Lora says she will follow up as May 11th gets closer, with a PDF map of the courtyard/lot showing where you’ll be. Meantime, C & P Coffee Company also is participating again – check in at the shop if you’re interested in selling there. Whether you’ll be selling or shopping (or both), continue to watch for updates here and on the official WSCGSD Facebook page.. Thank you! This entry was posted on April 10, 2013 at 10:49 am	and is filed under Registration, Updates. You can follow any responses to this entry through the RSS 2.0 feed. You can leave a response, or trackback from your own site.